The Council of the European Union has adopted new sanctions to counter the use of chemical weapons. “The EU will now be able to impose sanctions on persons and entities involved in the development and use of chemical weapons anywhere, regardless of their nationality and location,” the council said in a communique. Sputnik discussed the move with Adriel Kasonta, a foreign affairs analyst based in London. Sputnik: What is your opinion about a new sanctions regime to counter the use of chemical weapons? Adriel Kasonta: This legislation is clearly aimed at tying the hands of Russia with regards to helping the Syrian government recover from the plunder by the terrorists over there, and also supporting Iran. The UK is doing a perfect beating to gather as many voices as possible to vote against Russia, this is aimed at Russia because from the very beginning we know that, first of all, the Skripal case and we didn't see or didn't hear any verdict from the judges here in the UK. So for me, in my opinion it is a mockery of the legal system here in this country. How can you judge or how can you accuse a country as big as Russia or any other country without having clear evidence or a judicial hearing. So the presumption of innocence is not working here. I know that common law is slightly different from civil law, which I was studying back in Poland, but I do agree that the presumption of innocence should be applied in both cases. Sputnik: Can you tell us in more depth about what kind of measures are actually discussed in this document? Adriel Kasonta: The measures which are discussed there, well we have two different measures, first of all, we have travel bans and asset freezes in this document, but on what grounds? Jeremy Hunt, the UK Foreign Secretary, said that we need to redraw the red lines with regards to the usage of chemical weapons, but the examples of using chemical weapons mentioned in this very document are the Skripal case and Syria. What we know is that the (Russian) foreign ministry has sent some 60 diplomatic notes to the UK Foreign Office demanding that Russia be involved and having access to the investigation here in the UK with regard to the Skripal case because those people have Russian citizenship. They were also proposing legal assistance and cooperation. However, the UK declined corporation with regards to the Skripal case which is kind of odd; Russian citizens allegedly commit a crime on the British soil, I think that it is in both countries' best interests to cooperate on the legal grounds with regards to getting the answers to the question which has not been addressed so far. Also when it comes to the usage of chemical weapons in Syria, as we know, Syria's entire chemical weapons arsenal was abandoned and destroyed under the control of the Organization for the Prohibition of Chemical Weapons. Nevertheless, the United States tried Syria and responded without having any clear evidence. 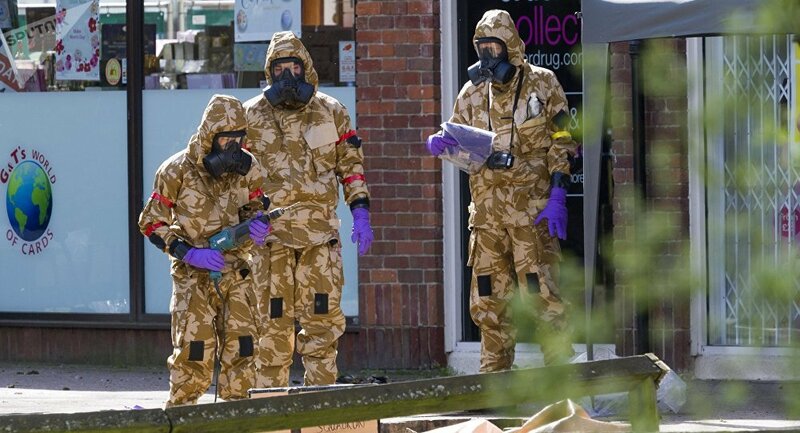 So I do understand that these measures will first of all hit Mr. Anatoliy Vladimirovich Chepiga, who's name allegedly was Ruslan Boshirov and Alexander Mishkin, allegedly Alexander Petrov, the two Russian military intelligence officers allegedly involved in the novichok poisoning of Sergey and Yulia Skripal, so I think that they will be the first targets of sanctions under the new regime here in the UK.